Here, at last, is a bog posting set in a bog — specifically, Chickering Bog in Calais, Vermont. Like many so-called bogs, it’s really an intermediate fen, which means that it’s not isolated from ground water like actual bogs are. Soon we were surrounded by pitcher plants, and I bent down and sniffed one. Ah, what a sweet perfumey smell! People who’ve never sniffed a pitcher plant have no idea what they’re missing. “That’s why I prefer dogs in satay sauce rather than in a bog,” I said, citing one of my previous bog postings. Charles and Nona, who loved dogs, understood. A bog (or even an intermediate fen) is a sacred place and should not be defiled. I needed to answer nature’s call, and rather than defile Chickering with my uric acid, I ventured back into the woods. All at once, in a grove of hemlock, I saw a trilobite! Ancient though it was, the trilobite seemed no less alive than I was. Likewise, it had the distinct odor of sandalwood. Okay, I’m being a bit disingenuous here. What I saw was not a marine arthropod, but the liverwort Bazzania trilobata, and I somehow didn’t think “A Living Trilobata” has very much cachÃ© as the title for a bog posting. Still, Bazzania trilobata and trilobites are not altogether unlike each other. 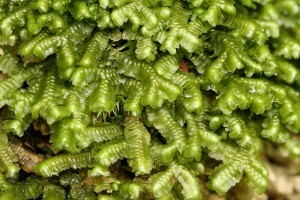 For liverworts are among the most primitive of all plants, perhaps even the most primitive, and their ancestors were almost contemporaneous with trilobites. thanks to Bob Klips, a fellow admirer of wee green things, for kind permission to use his photo. Here’s a bog posting about a bog. I went on a foray at von Engeln Preserve (a kettle bog) outside Ithaca, NY yesterday and found a variety of remarkable fungal entities. My favorite entity was, and remains, Henningsomyces candidus, for which I feel boundless love. 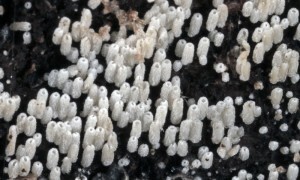 For more information about this species, go to my mini-essay about it at the Cornell Mushroom Blog (sic). Blogs fill me with a certain disgust, mostly because the word blog seems like it’s an amalgam of blah, bah, and blather. So, instead, I’d like to call what I’ll be writing for this site a bog. 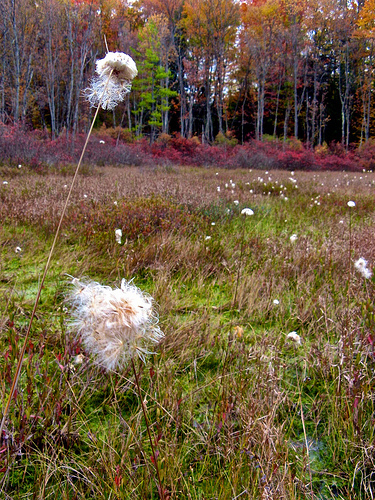 Bogs, to me, are beautiful, especially in the fall, when the reds of sphagnum, the teals of bog rosemary, and the whites of cotton grass suggest a painter’s palette. Unlike blogs, bogs smell of earth and life. My friend and bog expert Charles Johnson thinks wondrously strange gods inhabit bogs. So do I. Those gods have created (for instance) carnivorous plants like the sundew, the pitcher plant, and the bladderwort, the last of which can spring its trap on an unsuspecting insect in as little as two-thousandths of a second. Perhaps the rarest of all fungi, Echinodontium ballouii, can only be found in a bog. My favorite salamander, the four-toed salamander, is a bog inhabiter; I have never found it in a blog (a terrible habitat for a herp), but I have found it in several bogs in the Northeast. And here’s a parting salvo: bogs are timeless, whereas blogs are transitory, indeed downright evanescent. Santa Claus is a mushroom! Your browser gets stuck, and you find you can't leave Millman's bog, try as you might.